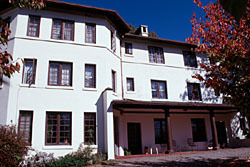 The Ottari Sanitarium was built by a prominent osteopathic physician, Dr. William Banks Meacham, in 1912. Osteopathy is a medical therapy that uses bone manipulation as a corrective technique. Dr. Meacham was a leader in his field. He held degrees from Mississippi College, Harvard and the Boston Institute of Osteopathy. He was elected president of the National Osteopathic Association in 1916, and was re-elected a year later in 1917. He held several offices in the North Carolina Osteopathic Association and the North Carolina Board of Osteopathic Examination and Registration. 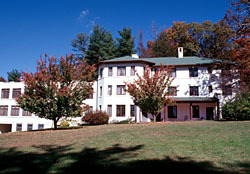 By 1912, Asheville was already recognized as a health resort. For this reason Dr. Meacham chose to build his sanitarium in Asheville. It was to be "the finest private sanitarium ever built" with "persian rugs, silk draperies, mahogany furniture and a glass aquarium with fish." The Spanish-mission style building was constructed of brick, primarily covered in white stucco. 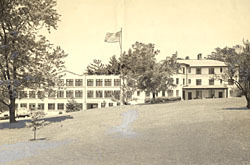 The opulent luxury combined with state-of-the-art treatment made the sanitarium so successful, that Dr. Meacham added another 23 rooms in 1923. The older, eastern half of the building housed 18 rooms and suites, all with private porches. The 1923 addition enlarged the sanitarium to a total of 40 bedrooms, 35 baths and 30 porches. The appearance was altered as well. The porches were enclosed, new casement windows were installed, an automobile passageway was made in the west end, and the entire building was stuccoed. The roof of the new addition was flat with a mission style parapet. An annex north of the building housed the power plant, providing steam heat. Today the basement of the annex still contains the building's heating source, a boiler, but the upper half has been converted into living quarters and a laundry facility. Like many people after the stock market crash of 1929, Dr. Meacham lost his property to the bank. After several bank failures, the property was transferred to the City of Asheville and the Buncombe County Commission. The building was converted into 33 apartments in 1937. Three years later, the building was sold to Harry Cutler Coburn and the name changed to The Coburn Apartments. Coburn died in 1948 and the property remained in the family until 2002. At that time, it was purchased by Denise and Bill Palas, who are continuing to operate it as a private apartment complex. The Ottari Sanitarium is located at 491 Kimberly Ave. It is still a private apartment complex. Public access is permitted to the grounds only.